Tomorrow, I will embark on the road again with Poets For Peace. It’s been nice to have the break to write for myself and catch up on other areas in my life, but with the increased aggression mounting in the Pacific from the United States war machine, I find myself drawn back into the endless peace walk I began with several other poets on the East Coast earlier this year. 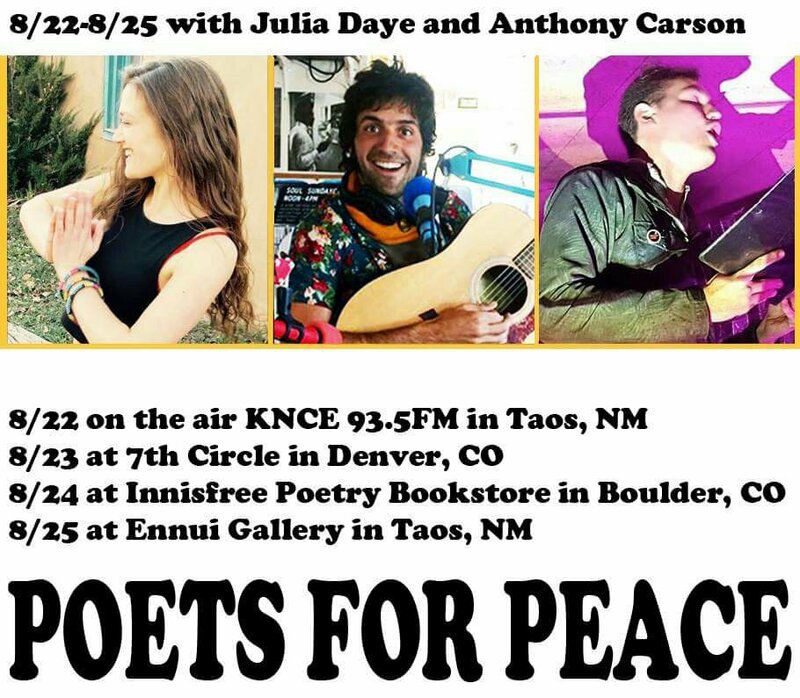 This time I will be joined by wordsmiths Julia Daye and Anthony Carson both currently residing in Taos, NM. Last year, though sometimes it feels like much longer ago, we were on the road up to North Dakota in a caravan to Standing Rock. I think I can speak for all of us when I say our experiences there greatly changed our lives. It was there that we saw what America’s war machine looks like when it is turned against its own people. But it was also there that we discovered a great Peace manifesting in the people’s collective prayers, sharing traditions far older than this Western imperialism. I’m excited to share the road with these great fellow Earth Protectors again. To share some light with our surrounding communities. To create dialogues of hope and progress. To channel peace and love. With this fire in our hearts we shall overcome. Dates are below! Hope to see you out at one of our shows!